FAQ: Should my concrete roof tile be installed using foam or screws? 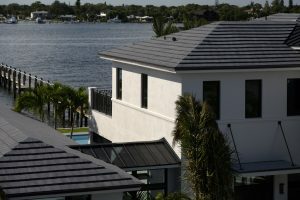 When it comes to the installation of concrete roof tiles, the level of wind exposure a home or commercial project is subjected to will determine what fastening methods should be used. If your certified roofing contractor has presented you with the option of choosing either mechanical fasteners or foam, then the choice is ultimately yours! Here are a few key points of both options to help you with your decision. Foam is a lightweight fastening option that provides strong adhesion without penetrating the roof and facilitates greater walkability on the roof due to the “cushion” that the foam paddy provides. This lessens the risk of cracked tiles. While wind resistance is improved using foam, it is a more expensive alternative to screws and nails and some building codes do require that the first row of tiles is mechanically fastened as well. This is because tile roofs tend to fail around the perimeter where wind uplift is more severe. A less costly option, screws or nails are commonly used to fasten concrete roof tiles to the roof decking. The decision of which should be used for your specific project will be made by your roofing contractor as this is also dependent upon the wind exposure. Compared to nails, screws have the advantage of not backing out and have stronger holding abilities. Screws also self-seal as they’re driven down through the decking and underlayment. Applicable to all concrete roof tile profiles, a Hybrid Roof System is achieved using both a single-component polyurethane roof tile adhesive and mechanical fasteners, such as screws. The use of these in conjunction with one another creates a significant increase in uplift resistance when compared to either of them being installed independently. Tests also show that this roof system produces wind uplift values that are nearly as high as a two-part foam adhesive application, but at a lower cost and with an easier, faster installation. To learn more about wind exposure requirements and tile roof installation codes, download the Tile Roofing Institute Alliance installation guide for your region. For additional questions regarding concrete roof tile, contact your local Eagle Account Representative.